How Did Jerry, George, and Elaine Never Go Bankrupt? Why I decided to rewatch Seinfeld is beyond me. It probably had something to do with learning how to write for television, studying comedy traditions, yada yada yada. So far it’s been a surreal experience. I’m transfixed by these people who have no problems. Seriously. No problems. The Show About Nothing is a horror story about lives with no depth. That nonchalance extends to the “real” issues of a person’s life. Maybe I’m a little too indoctrinated by the onslaughts of Very Special Episodes that were the norm growing up. I actually admire the No Hugging, No Learning movement that Seinfeld instituted. But it can get to be a little too much at times. Even something as life-altering as the death of a fiancée only elicits a minor freak-out from these characters. 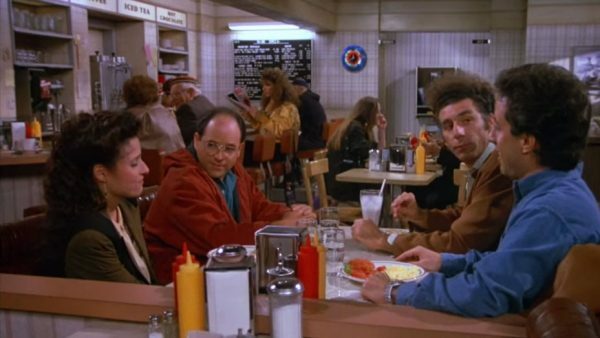 Jerry, George, Elaine, and Kramer regularly invent issues and problems to complicate their lives, because their mountains literally are molehills. Have they figured everything out? Have they solved every problem ever known to grown adults and can therefore spend their energy on pointless nonsense? That sense of uncaring also extends to money. That’s what makes this show hard to rewatch as an adult. How does Elaine not freak out when she’s cut from her major job at the publishing house? How does Jerry exist in the gig economy in the ’90s and not flail? And George. Oh god, George, how do you exist? You with your job-hopping and devil-may-care attitude toward spending money on women. I made my way into Season Six, growing more and more infuriated. Yes, these were the years of Bill Clinton and economic growth. But how on earth did these characters regularly shop, go out, live in apartments filled with stuff and yet still have money in the bank? How could one realistically live that lifestyle? Then it hit me: savings. The characters on Seinfeld have to be diligently setting aside money for their savings accounts. It’s literally the only way these people make sense. This fanfiction of the 1990s lifestyle only works if everyone had at least a few grand in savings at all times. Once that possibility snaps into view, the characters actually appear quite financially responsible. Jerry travels all the time for his work, but unless he’s going on a date he rarely eats anywhere nice (corn flakes being his one regular indulgence). He hardly ever shops. The notorious puffy shirt was a gift. Kramer eats whatever food Jerry doesn’t use—while providing free housesitting—so nothing is wasted and Jerry doesn’t have to worry about pests. Lots of people my age could probably take a few lessons from Kramer, the original hipster doofus. There’s a theory that Kramer is actually living off an inheritance, which explains his willingness to invest in any crazy scheme once someone has explained it thoroughly enough. But that doesn’t mean Kramer spends money willy-nilly. He makes luxuries like Cuban cigars last, often using them to make connections to his already huge network of friends and co-conspirators. Most likely the richest character on the show, Kramer uses his privileged status to get him even more opportunities. After all, how else do you get richer except by networking? Elaine, meanwhile, works any job she can get, from personal assistant to copy editor to cave dweller. Her apartments are homey but not huge. She’ll make sure a designer dress fits perfectly before buying it, lest she be fooled by a skinny mirror. She also doesn’t own a car—although Jerry does, in spite of (or perhaps because of) his travel-heavy job. With the major exception of Jerry, no one in the main cast travels frequently. Kramer did most of his traveling in his youth (did you know he was in the Army?). George takes pleasure in small, everyday things. When Elaine travels, she’ll go all out or not at all. Better to save up for a luxurious island getaway with your shrink rather than blow it all on a beach weekend. She barely packs for a surprise trip to the Hamptons. Why spend a bunch of money on a surprise? Then there’s George. I never thought I’d like this silly little man. But if there’s one thing George Costanza is known for, it’s his frugality. He didn’t want to spend bundles of money on wedding invitations because “you read it and send it right back.” He probably would have loved the e-invitation trend in the early 2000s. Why waste money over something so inefficient? That’s the George Costanza way. Of course, George also has no shame. The second he loses a job, he moves in with his parents. Think about it. He doesn’t consider his options. He doesn’t hold out to see if he can still afford the apartment. He just picks up and leaves. Not to say that George Costanza is a completely admirable (or even realistic) human being. It’s not a problem for him to move into his parents’ house because he’s only thinking of his needs and not, for example, of whether his presence would inconvenience them. But in consequent episodes, unlike other manic periods in George’s life where he literally parked cars for a living, he uses this time to think about what he wants. He uses living with his parents to think critically about what he really wants to do. He uses a financial setback exactly how it’s meant to be used: as an opportunity to reflect, strategize, work hard, and find a new path. The next time we see him, he’s working for the Yankees. How much more sense the cast of Seinfeld makes when underneath it all, they’re a bunch of incredibly financially savvy adults. They may fail at everything in every aspects. But their nest eggs? On lock. Brit McGinnis is a copywriter and author of several books. Her work has appeared on Paste, SparkNotes and anywhere fine stories are sold. She lives in Portland, Oregon.